Kolhapur is situated in the southwest region of India between Goa and Mumbai. It was dominated by the Marathas and came under the Deccan Division of Bombay Presidency. Later, its name was changed to the Deccan States Agency in British India. The flag of the state had a swallow-tailed orange pennant. Coins of Kolhapur were issued only in silver metal in various fractions such as ¼ Rupee, ½ Rupee and Rupee. 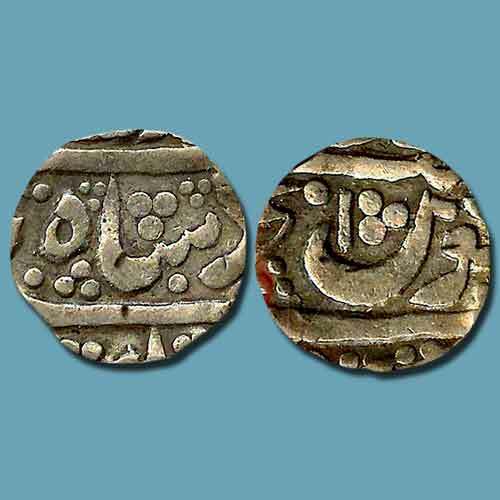 All these coins were issued from Azamnagar Gokak mint in the name of Muhammad Shah. The obverse the coin bears King’s name and title while the reverse of the coin inscribed with Persian legend.